DEBORAH CROMBIE: What a special treat we have on JRW today! 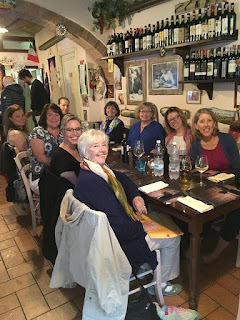 For everyone who wished they could attend Rhys's writing retreat in Tuscany, now we get a first-hand account of all the fun! Here's our Jungle Red special friend, Karen Maslowski (who comments as "Karen in Ohio"), on--well, I'll let Karen tell you! When I first saw the announcement of Rhys’s nine-day mystery writing workshop in Tuscany, my inner travel diva got all excited. What a great combination: writing with other like-minded students in a lovely environment, all meals provided, and with one of my favorite writers. However, I couldn’t bring myself to commit to the time, and to the financial outlay. And while I was dithering, the class filled. A couple weeks later, Rhys posted on her Facebook page that a spot had opened up, and I decided that was my sign, so I signed up for the open place. A local travel agent helped me schedule flights, trains, boats, taxis, hotels, tours, and even concerts, so I would have a structure to what became a three-week trip. 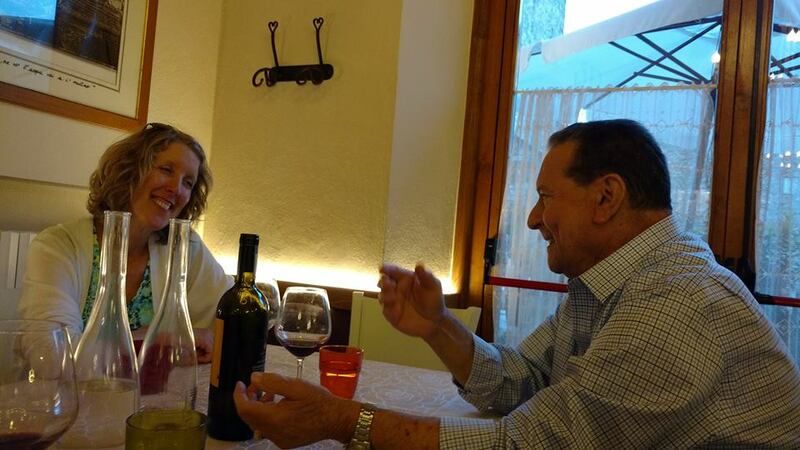 My youngest daughter decided to join me for the first three days in Venice, where neither of us had ever been. By the time I met the workshop group I'd been in Italy for four days, and I was fairly well adjusted to the time zone difference. 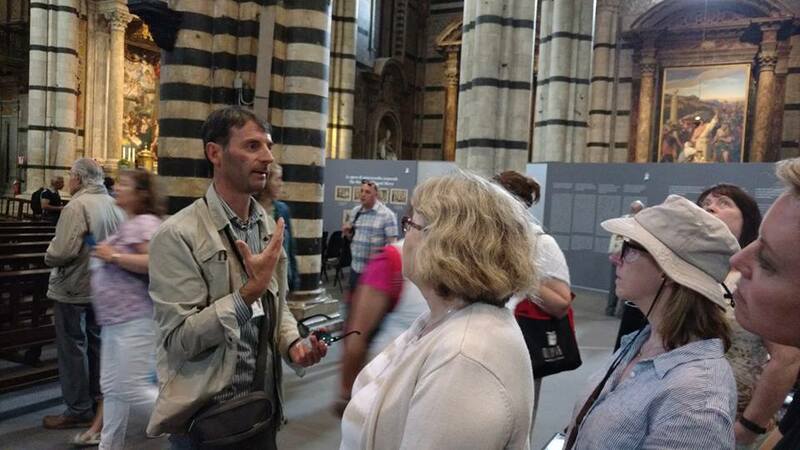 Before the workshop Minerva Education picked up all the participants in Florence; afterward I chose to go back to Florence for one night. Because my maiden name is Brenner, I decided to take a train from Florence to Innsbruck through the spectacular Brenner Pass in the Alps. From there I would go to Munich for a couple of days, and then on to finish my journey with three days in beautiful Prague. You can read more about that part of my trip here, with photos: See the USA Watch for more, as I am posting it in sections. The six workshop participants came from all over: Florida, Tennessee, Michigan, California, Washington DC, and me from Cincinnati. We had a good mix of accomplishments, too. Some of us were published in non-fiction (one participant has a long career as an award-winning sports and real estate journalist), some had nearly finished novels, and some of us were in the beginning stage of fiction writing. Every one of them was an interesting person, too, and we had fascinating conversations over many meals and long walks. Rounding out the group was Rhys's charming husband, John, who added his own sparkle to every meal and gathering. Rhys structured our sessions with one main topic a day: intro to mystery; plot, structure, POV; characters; dialogue; setting; creating mood; first line/paragraph/page; marketing, finding an agent. Each morning we met for an hour or two to discuss that day’s area of interest. Afterwards we broke for individual activities, including a daily writing assignment, and later in the afternoon we'd meet again. At the second meeting of the day everyone shared what they'd written. Rhys would give her opinion, constructive advice, and tips on how to tighten or expand or better the piece in some way. The group usually also had something to add, always insightful and helpful. The best part of this readout each day was seeing how uniquely distinct each of our voices are, and watching as characters took shape, or plots emerged. We talked about the different stories, and by the end of the workshop we were all anxious to know the outcomes of each. The owners of Minerva Education, Piero and Cajsa (pronounced Kī'-sza) Baldini, are excellent hosts, and they provided a rich cultural experience, as well as access to a teacher of Rhys's caliber. 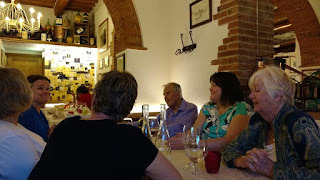 In addition to providing a lovely hotel for the workshop, they hosted every excellent meal with a flourish (and delicious wines), and provided many insights to life in Italy, past and present. 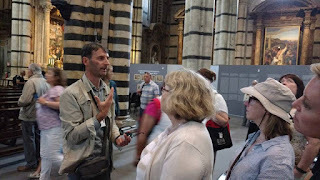 Piero is a native of Florence, and a font of knowledge about all things Italian. In addition to the workshop, Piero and Cajsa organized several other activities for us. 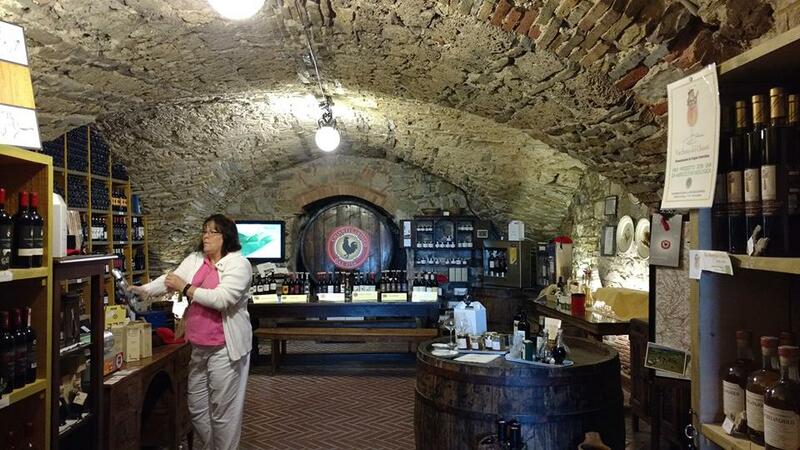 We had a private wine tasting of Chianti and local cheeses, olive oils and balsamic vinegar in Castellina. 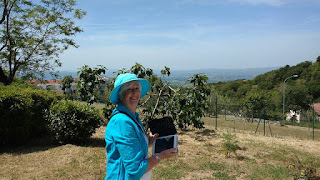 We toured some local Etruscan tombs, and learned a bit of the history of the area. We spent nearly an entire day of visiting Siena (a nice break for Rhys, who opted to stay back and sketch. And do laundry). 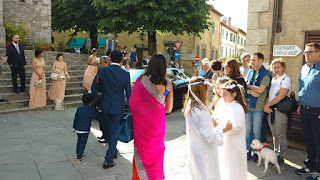 And we all trooped into town on the Sunday of Corpus Christi for Mass in the church of San Salvatore, and later that day, for the scheduled procession. The procession was supposed to take place at 6 PM, but first the wedding party had to clear out. The bride and groom were both British (they'd driven there from London, we later discovered), but of East Indian background, so many of the guests wore lovely saris. 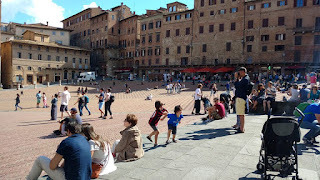 This little town in Chianti was hopping with activity! The hotel is charming and lovely, and in a peaceful spot, while still within easy walking distance of Castellina. We each had our own rooms with en suite baths (and bidets, can't forget those!). The pool is beautiful and surrounded by flowers, and the staff is attentive and efficient. I already want to go back. My smiling photo was taken during one of my best writing sessions, on our porch overlooking the vineyards and olive trees across the road. Karen, I hope you'll tell us more about what you learned, and what parts were the most helpful to you. And Rhys, please chime in and tell us your favorite parts of the Tuscan adventure! 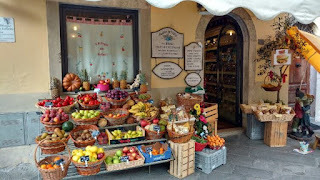 REDS, I think we should plan a Tuscan retreat. 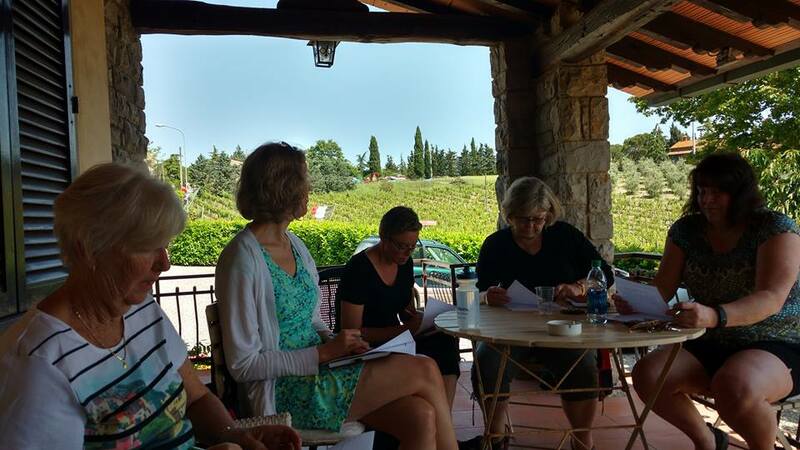 READERS, would you enjoy a workshop like this? Oh, this sounds so marvelous! Karen, thanks for sharing this fascinating account of your time in Tuscany and your wonderful pictures . . . . Thanks, Deb and Joan. Rhys is very gracious, and generous with her advice. One note: the photo of Piero does not include Cajsa; the blonde woman is Kathy Orton, one of the other participants, an award-winning journalist with the Washington Post, and aspiring novelist. What a fabulous time! I'm sure it really jump-started everybody's writing. An experience of a lifetime for sure, Karen. You'll let us know when your book comes out, right? I am so jealous! I'm glad you grabbed that open spot, Karen. It was meant to be yours! Deb asked what I learned. At the beginning of the retreat I had a project that had stalled, but that I was hoping Rhys could help me get back on track. She had some good suggestions, and I've tweaked it a lot. Of course it needs vast amounts of work, even so. But after the retreat I traveled alone for eight days, and between the writing workshop and that experience I came up with a different story altogether, one I'm compelled to write about. It probably won't fit into the mystery category, although Rhys says "all novels are mysteries". What a divine trip!!!! it sounds absolutely perfect in a million different ways, Karen. Oh my goodness, how wonderful! Karen, what a marvelous adventure for you--in so many ways--and isn't it surprising when that story we've been struggling with turns out not to be the story we NEED to write about! Best of luck with your new idea. And, yes, Deborah, I would love to do a workshop like Rhys's! Karen, what a great thing to do! Sounds like you had a wonderful time. I love the pictures and hearing about all of the things you did and would truly enjoy hearing something special about your learning experience with Rhys. And yes, I would love to go on a special writing retreat like that! This sounds like such a lovely and educational trip. I am sure that all the participants came out of this with new-found knowledge. And imagine it is equally as wonderful for Rhys, reinvigorating with so many new perspectives to assimilate. How wonderful. Thank you for sharing, Karen. On Corpus Christi Sunday we all went to Mass together, and we learned there would be a procession that evening at 6:00. We'd been watching the parishioners putting together banners and things, so we decided to go back from the procession. When we got there, the wedding was breaking up, and the First Communicants were gathering, along with the townspeople, tourists, and us. I took video of the procession, and later did research on it. Corpus Christi is the one day in the liturgical calendar of the Catholic Church that uses the baldachin, a canopy that is carried over the priest as he proceeds, carrying the Host. In this procession, we noticed that the band, playing a slow March, came first, then the banner of the church, then the priest and his attend as the, then the parishioners, with the women first, then the little First Communicants, and finally the men. After the retreat, one of the other students and I went to an opera staged in the English church in Florence (La Gravitas, which has one of the sillier librettos, but fair music). Sitting next to us was a young English woman, alone, and she and Bobbi struck up a conversation. Turned out that she had been a guest at that very wedding. Gosh, what a thrilling time. La Traviatta. Thanks, autocorrect, but I didn't need your "help". Creative, though! Karen, how interesting that it took time and travel on your own to allow a new story to take root in your imagination. That's one of the many reasons I love going to England on my own. It seems the only time I get to think, and process things, without interruption. Deb, being on my own was also good for observing people. No distractions, right? Hank, that's amazing. Castellina is such a tiny place. And yes, the food was always superb. Oh what a wonderful recap! Someday I am going to visit Italy. 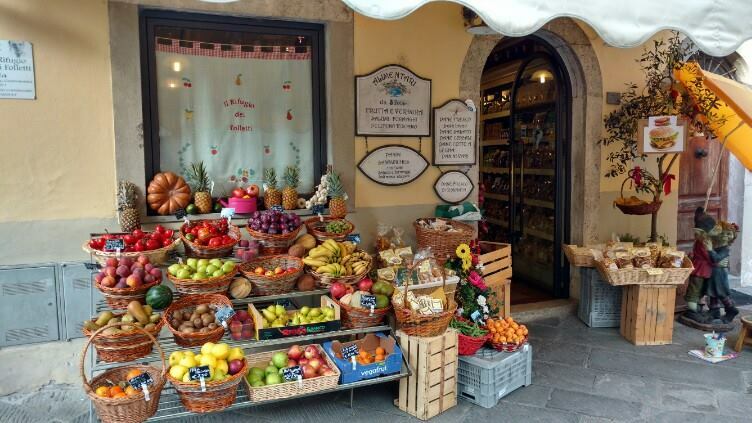 I visited an old friend last weekend and she was showing me pictures of her family's trip to Italy - how gorgeous. 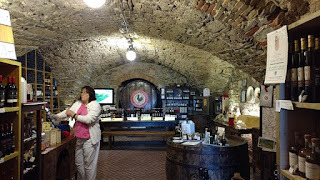 The history, the food, the wine! Of course, there is also the walking - but I could overcome that (I think). So glad you took the opportunity to go Karen. Annette is right - that spot was meant to be yours. Loved all of this, but I am particularly intrigued by the comment, "Rhys says all novels are mysteries." Can you expand on that, please? Sure, Susan. Thanks for asking! In any kind of novel doesn't there need to be some kind of burning question? Any good story needs a puzzle, or some kind of hidden issue that needs to be discovered or resolved by the the end. Isn't that what keeps us turning pages? I think that was one of the best things I learned in the workshop. I'm thinking we should have a Jungle Reds writing retreat at the same place! Who is up for it? Oh, thank you, Karen. I was curious as six cats about the retreat. It is wonderful to share it vicariously. Love that you not only got one story on track,but birthed a second in your travels. Travel (and Italy) will do that. 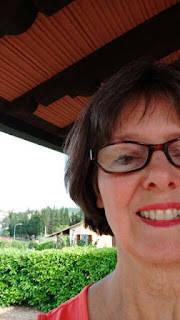 How was the Brenner Pass? It was spectacular, Kait. I stopped in Innsbruck for two nights, too. Watch my blog, I'll be adding segments to it, including the part about the Pass. Rhys, you're right, the combination of participants was almost magical. Love love love this! Thank you for writing about your experiences. I felt as if I was there with you. Please keep us posted about your novel. And I love the photos too! a writing retreat sounds wonderful! p.s. on July 16th, there will be a save our cozies readathon. Check Facebook page and/ or goodreads for more information about the readathon. Karen, thank you so much for sharing your wonderful experience and those fantastic pictures with us. Such a beautiful setting and Rhys as your teacher! And then, your additional traveling. What an adventure! So smart of you to take advantage of the writing retreat to do other traveling. 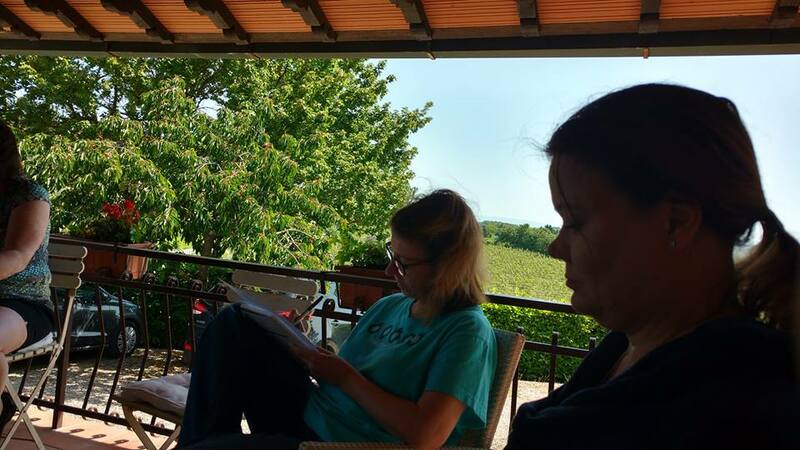 I think a retreat that includes readers and reviewers would be awesome, too. As a reviewer, it would be productive to talk to authors about what they hope to find in reviews of their books, maybe even discussing reviews of their particular books. Late getting in to comment because I'm visiting my parents in Syracuse. Karen, I'll echo everyone else and say thank you for sharing your pictures with us! Everyone looks so relaxed and happy. I say here, here to the writing retreat... so long as it isn't in Maine in February! Thanks for inviting me to share this today, Reds. It's an honor. Karen, what a lovely blog. Thanks so much for sharing with us. Looking forward to reading your novels. 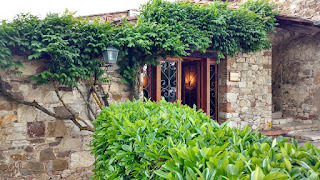 I've been to writing workshops in Cape Cod, but Tuscany sounds like Heaven. Thanks for sharing! Cape Cod sounds like heaven to me at the moment! Thanks so much for sharing with us, Karen! What fun, Karen. When do we get to learn about the fruits of your labor? I would seriously love to go. Jonathan, too. Thank you, Karen! 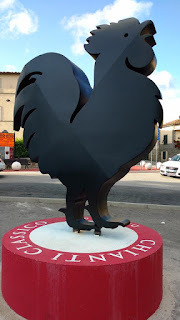 I once spent a few days in Castellina -- what a very special place!! An experience like this one is both deep and challenging -- when you feel like adding more (such as your writing project), we will all be ready to listen to Karen in Ohio.